It's always worth a trip into Los Angeles to hear a set of songs that maintain the same spirit as their recorded selves, but within the context of a quartet. The set of songs belonged to Detroit native Brendan Benson's show at the El Rey Theater this past Tuesday. Benson's albums carry immense musical charm and that is enough even if you don't get to hear the sound of a school bell in his song "Spit it out Now" - its video I recently saw broadcasting in Nordstrom's juniors department - or the patchwork of vocal patterns at the end of "The Alternative to Love," which is the title track to his new album out on V2 Records. Benson is currently plowing through the last leg of a long-winded tour promoting his new record. He played tunes ("Tiny Spark," "Metarie," "You're Quite") off his last album "Lapalco" released in 2002 (StarTime Records). He recorded his major label debut "One Mississippi" in 1996 under the Virgin Records label and was subsequently dropped. According to legend, Benson used the last of his advance money courtesy of Virgin Records to buy a house in Detroit, turning part of it into a studio and pockets of creative spaces where the keys might stand. The tiny Benson, wearing a V-neck white T-shirt, reflected off the crowd like a well-tuned jazz man, although not as tuned up on his acoustic guitar - the crowd waited dizzyingly as he fixed it. The group of men playing bass, keys, two guitars and drums also played "Metarie" - the delicate drumming on the chorus had a little more meat on its bones that the recorded version. Benson did give a "shout out" to Los Angeles with the line "I know a guy, lives in Los Angeles," and then substituting the next line, "Sometimes his life there makes me so jealous" with "I can't figure out why" on the song "Metarie." Benson continues with a progressive maturity in the department of love in all different forms - from the demise of a relationship to a friend's betrayal to the delusions of an obsessive fan - with "The Alternative to Love" compared to "Lapalco." Benson has a talent just like Joni Mitchell for creating a sense of identity between their music and the listener through a brilliant rush of lyrics that voice applicable situations, tendencies and personalities expressed by relatable characters speaking in first-, second- and third-person musical narratives. When Benson stands up in front of a crowd and sings, you can't help but feel compelled to stick around after a show and ask him which tunes are actually autobiographical. He so easily slips into the perspectives of various human creatures with all of their flaws and virtues. Like a good piece of fiction, he evokes sympathy in the unsympathetic. 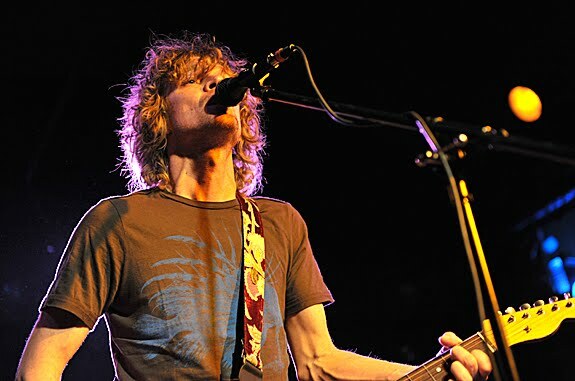 Aside from the lyrics, Benson has also shown his knack for basic composition, writing songs that are brimming with melody, and as once again evident on the new album, the beauty of a rousing arrangement. Benson, born in 1970, left his birthplace of Detroit with his mother and settled a poor neighborhood in New Orleans. He left for Los Angeles when he was 18 and returned to the Big Easy to record "One Mississippi." If you like Benson on record then you'll probably dig him live and at the end, only wish he played longer. 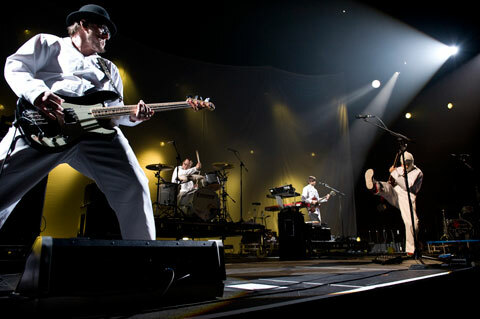 Playing a second straight night at the Long Beach Arena, brash rockers of the band the Foo Fighters made it their mission Sunday night to win over a few of the more devoted Weezer fans, who were there to see their beloved and polite quartet play just prior as co-headliners. “Our goal tonight is to convert some of the hard-core Weezer fans into drunken, sloppy Foo Fighters fans,” said lead singer and guitarist Dave Grohl who also mentioned that he’s never seen anyone pound a beer bong faster than Weezer’s frontman, Rivers Cuomo. 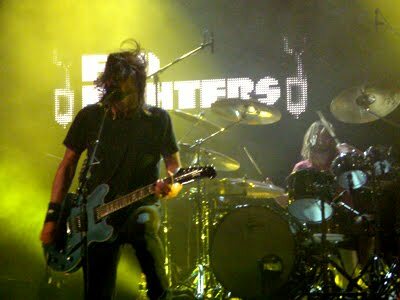 The foursome - Grohl, drummer Taylor Hawkins, bassist Nate Mendel and guitarist Chris Shiflett - ended the show and dedicated all of the set’s love interludes to their friends in Weezer, who have been touring with the Foo Fighters. The members of Weezer, with their unassuming collared shirts and black-rimmed glasses, are the kind of men you’d invite to an intimate dinner party with perhaps the demure Mendel and Shiflett. However, you’d have to stick Grohl at the kids’ table and ask Hawkins outside to work the valet. After playing several opening songs including the hit “My Hero” and “Best of You” to a crowd of general admission attendees and the remaining with assigned seats along the arena’s upper levels, Grohl unleashed a robust and loud belch into the microphone. “I’m a little hung over tonight but I’m feeling a little better and I came into work today, into the office feeling a little sleepy, a little dizzy,” he said. Throngs of parched teenagers and young college kids put their bodies through the ringer by squishing them up against barricades lining the front of the stage, and with mosh pits forming and security guards grabbing crowd surfers every few minutes, the audience was almost as entertaining as the band. Hawkins, behind the drum kit for the entire show, walked out to the front, looking like he just returned from the gym, his thin frame glistening of sweat, wearing a tank top, cotton shorts, white Adidas shoes and the comically colored black socks while smoking a cigarette. 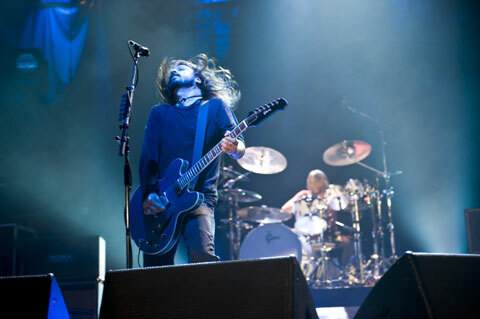 Grohl took Hawkins’ place while Hawkins strapped on a red guitar, took a few more drags the same way he did before kicking off the show and sang “Cold Day in the Sun.” The two switched back into their respective spots as Grohl reflected on his years as a drummer (with Nirvana). The show’s most poignant moment came in a moving rendition of “Everlong” off the 1997 “The Colour & The Shape,” which Grohl sang with only his guitar, showcasing the song’s haunting and striking melody and fleetingly starry-eyed yet tender lyrics that he dedicated to all of the “mellow, old-school fans.” Grohl’s performance culminated when the rest of the band walked back out on stage and finished up the song playing the last four lines of the song (I wonder if everything could ever feel this real forever/If anything could ever be this good again/The only thing I’ll ever ask of you/ You’ve got to promise not to stop when I say when) in wild, earsplitting Foo Fighters fashion.